Puppies come home from GDA with an adorable little puppy kit — a nice GDA tote bag containing a bowl, a brush, a couple of collars, a nylon leash, a 5-pound bag of dog food, all the puppy paperwork, and my favorite thing: a soft toy for the puppy to snuggle with, which is meant to ease the transition from a snuggly puppy-pile full of littermates to a sometimes lonely first night in a strange place. 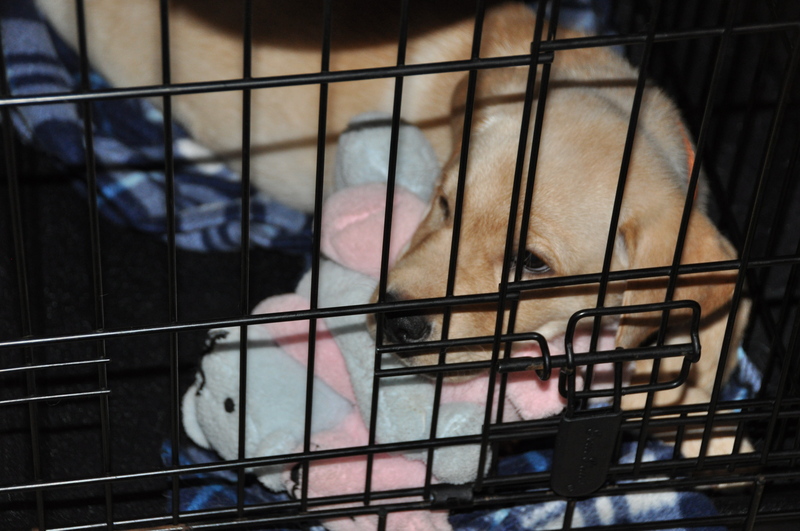 Jethro LOVES his pink-and-blue hugging teddy bears, and always sleeps in the crate with is head resting on them. If this toy (which stays in his crate so he and Truman don’t tug it into a million formerly-adorable pieces of disembodied fluff) survives Jethro’s puppyhood, and if Jethro makes it to guide work, I’ll probably end up giving it to his new partner, along with the baby blanket I rubbed against all his littermates on puppy pickup day. And speaking of littermates, we received the coolest thing in the mail from GDA today! GDA is very protective of information about their breeding lines and which puppies come from which dogs in the program, so even puppy raisers aren’t allowed to know that stuff. (They have good reasons; it prevents a lot of unnecessary freak-out on the part of people who might hear something about a dog who was dropped for a medical reason and fear that their related puppy-in-training or guide dog will also have the problem, blah blah blah etc.) But we got a DVD in the mail marked “From Grandma!” It’s full of still photos and video footage of Jethro’s litter in the puppy nursery, set to music like “Sunrise, Sunset” from Fiddler on the Roof. It must have taken forever to put together, and it’s the sweetest thing…. We don’t know who you are, Grandma, but if you’re out there reading this, thank you! We love it. Your “grandson” Jethro is doing well, and we hope you’ll give his mama-dog a kiss from us. This entry was posted in Breeders, JETHRO, Littermates, Pick-Up Day. Bookmark the permalink. What neat gifts. The DVD would be gold to me. I agree! If Jethro makes it to guide, I’m going to try to get that duplicated for his person as well. His puppy pictures are SO CUTE….